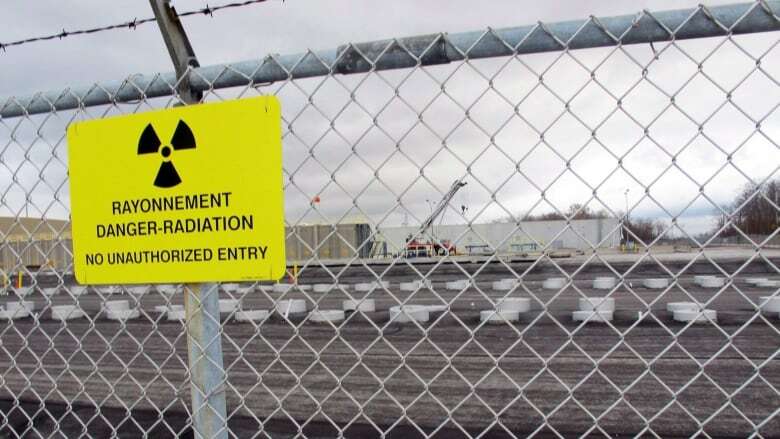 Waste management authorities have ruled out one part of northern Ontario as a suitable site for a bunker to store used, but highly radioactive, nuclear-reactor fuel rods. In a statement on Wednesday, the Nuclear Waste Management Organization said the Elliot Lake and Blind River area between the cities of Sudbury and Sault Ste. Marie are out of the running. "Technical studies and engagement with people in the area identified a number of factors that would pose challenges in siting a repository," the organization said. "These include complexities associated with the geology, limited access and rugged terrain, and low potential to develop the breadth of partnerships needed to implement the project." Three other communities in northern Ontario remain as potential sites: Ignace about 250 kilometres northwest of Thunder Bay, Manitouwadge, about 395 kilometres east of Thunder Bay, and Hornepayne, about 480 kilometres east of Thunder Bay. The other two remaining potential sites -- South Bruce and Huron-Kinloss -- are close to the Bruce nuclear reactor on the Lake Huron shoreline near Kincardine, Ont., site of a long and ongoing battle by Ontario Power Generation to win approval for a deep geologic repository for low and intermediate level radioactive waste. Dan Marchisella, mayor of Elliot Lake, expressed disappointment at the exclusion of his community after five years, calling it a "huge potential loss" for the entire district. The former mining town, once known as the uranium capital of the world, felt that putting itself forward was the responsible thing to do given the vexing question of how best to safely store waste that remains toxic for thousands of years, he said. difficult to access that area." The hunt for a place to permanently store used nuclear fuel rods -- about 2.7 million bundles currently exist -- began in earnest in 2010, with 22 communities expressing interest. The dangerous material is currently stored in pools of water or in vaults on site at reactors in Ontario, Quebec, New Brunswick and Manitoba. The envisaged repository would be about 500 metres underground. informed and willing host and strong potential for the partnerships that will be required to implement the project," said Mahrez Ben Belfadhel, a vice-president with the waste-management organization. While the organization expects to be able to choose its preferred site by about 2023, winning any approval for an underground bunker is likely to go years beyond that date if Ontario Power Generation's odyssey is anything to go by. The utility took years to win tentative approval in 2015 to build a bunker at the Bruce site near Lake Huron for material that is far less toxic than nuclear fuel rods but has made little progress since. Federal Environment Minister Catherine McKenna is now waiting for Indigenous communities in the area to weigh in -- a process likely to take at least another year. In addition, scores of communities around the Great Lakes have decried any suggestion the site so close to the lake is suitable -- paving the way for what could be years of court battles. In defence of its choice, Ontario Power Generation has said transporting radioactive material to long distances to a storage site would only add costs and increase the risk of toxic releases. Marchisella, who said nuclear material already moves safely up and down Canada's highways every day, did express concern at storing waste anywhere near a Great Lake, as OPG is proposing for its facility. "As the planet gets warmer, we know that water levels continue to rise," Marchisella said. "So when you look at the northern communities further up north, we're higher up in altitude." To ease the pain of rejection, the waste organization said it would make up to $600,000 available to Blind River, Elliot Lake and Sagamok Anishnawbek First Nation, and another $300,000 for Spanish and the North Shore for community projects. Nuclear Waste Management Organization starts drilling near Ignace, Ont. Is this northern Ontario township a good spot to bury nuclear waste?